Sustainability is woven throughout everything we do. As a founding member of the Sustainable Furnishings Council, we love a product that looks good and does good. Here are a few sustainable home decor items that exhibit our passion for supporting healthy environments, inside and out. When we can take a consumer good and recycle it into something beautiful, we're all for it. Emmet is made in Duluth, Minnesota, from 100 percent recycled high-density plastic. Each chair saves 300 milk jugs from going into landfills! 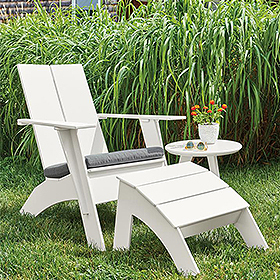 Eco-friendly, durable, comfortable and easy to care for, Emmet is an outdoor classic. 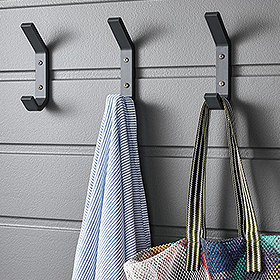 These indoor/outdoor wall hooks are also made from 100 percent recycled high-density plastic that primarily comes from post-consumer products like milk jugs. These are one-of-a-kind finds, only available to purchase in-store! Check your local store for availability. Salvaged from Cleveland's Taylor & Boggis foundry, these hand-made wooden circular patterns were once used to form sand molds for the production of iron parts and components. 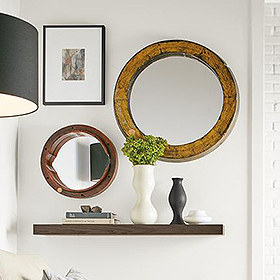 Each piece is restored and repurposed into frames for these unique mirrors. 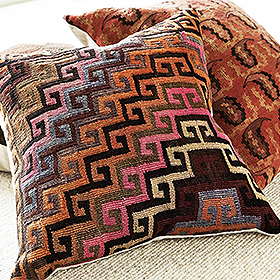 The front of each pillow is made from a century-old vintage Kilim rug, originally handmade in Turkey. They have a variety of patterns, colors and textures that encompass the Kilim tradition. 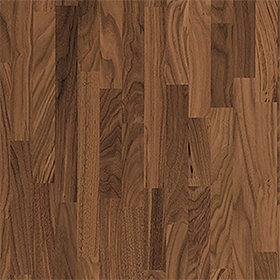 We use wood from carefully managed forests and strive to get the most material out of every piece of lumber. We've created products made from the small pieces left over so we can use less wood to create more furniture. Our Halifax candle holders are crafted from rich walnut that comes from lengths of wood left over after making dining tables. 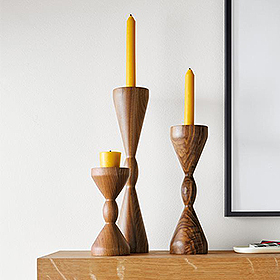 These modern candle holders are sized for tapers on one end, tea lights on the other. Our butcher block tops, which are part of our Top + Base program, are crafted from pieces that are left over from the construction of our Berkeley collection. Clearance and Floor Sample Event Coming January 5!